In this sixth volume of The History of Middle-earth the story reaches The Lord of the Rings. 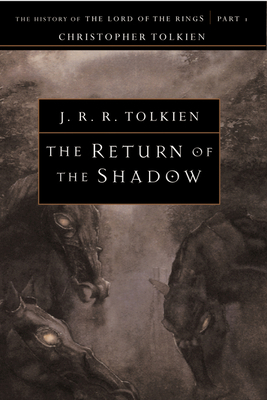 In The Return of the Shadow (an abandoned title for the first volume) Christopher Tolkien describes, with full citation of the earliest notes, outline plans, and narrative drafts, the intricate evolution of The Fellowship of the Ring and the gradual emergence of the conceptions that transformed what J.R.R. Tolkien for long believed would be a far shorter book, 'a sequel to The Hobbit'. The enlargement of Bilbo's 'magic ring' into the supremely potent and dangerous Ruling Ring of the Dark Lord is traced and the precise moment is seen when, in an astonishing and unforeseen leap in the earliest narrative, a Black Rider first rode into the Shire, his significance still unknown. The character of the hobbit called Trotter (afterwards Strider or Aragorn) is developed while his indentity remains an absolute puzzle, and the suspicion only very slowly becomes certainty that he must after all be a Man. The hobbits, Frodo's companions, undergo intricate permutations of name and personality, and other major figures appear in strange modes: a sinister Treebeard, in league with the Enemy, a ferocious and malevolent Farmer Maggot.